Somewhere around the year 2000 I was hired to pick writers for a web-based tv show that Barnes & Noble planned to launch called Behind the Words. The show was basically video interviews of the writers I’d chosen, and I also had to write the interview questions and the content for the pages we were building out for each writer. It never launched, and I don’t know why. But it was an incredibly eye-opening experience for me about working with writers. About half were perfectly fine to work with, but a surprisingly large number were rude and difficult, and some were outright horrible. To this day I can’t read a word any of the horrible ones have written, they were that terrible. I’m surprised they’re still alive (one of them isn’t, but he was very very old). I always expected them to spontaneously combust from awfulness, or from someone finally deciding, “That’s it. You can’t be in the world anymore.” I’m sure the process was annoying for them, and my questions maybe have been irritating. Oh god, for all I know they were the stupidest questions EVER, but I was trying to think of questions that might illicit answers that would work on the web. The point is, I was doing everything I could to sell their books. Some of the writers however, were absolutely wonderful. And of that group, the writer George Saunders was hands down the most gracious and fun. The answers he sent back were so funny and endearing they were passed around to everyone in the office and all our friends. He’s now hugely famous and respected (he was known and respected then, but now he’s a mega-writing star) and I love the justice of that. Everyone I know is talking about his latest book. One friend said she wanted to read it aloud to people she loved it that much, and another is reading it aloud to a friend in the hospital. I just went through a folder of old email I’d saved, hoping I’d saved the email with the answers he’d sent, but I couldn’t find it, damnit. Tomorrow I’m going to post about how depressed I got seeing some of that old email. 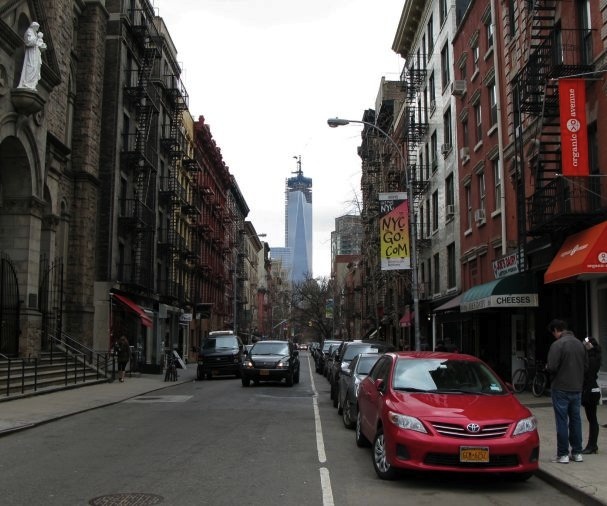 Yet another picture of One World Trade Center, this a view from Sullivan and Houston Streets.